Alan Davis knows his outdoor chairs can stand up to the rigors of travel. Early on, Alan took his design prototypes on 30-day whitewater rafting excursions, just to make sure they met his standards for comfort, durability and portability. Today, Alan is the founder of Blue Ridge Chair Works, whose mission is to craft American-made outdoor furniture that’s built to last. 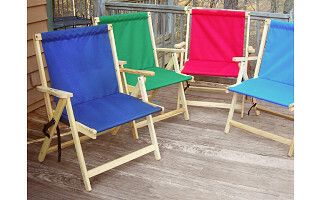 Instead of flimsy beach chairs that buckle and tear, or clunky folding chairs that don’t fold very well, Blue Ridge chairs are compact powerhouses. They’re made in Asheville, N.C., with kiln-dried Ash hardwood and finished with protective Danish oil. Fade-resistant polyester fabric forms the seat, and stainless-steel hardware holds the components together. Ideal for people on the go, the two-piece Blue Ridge chair can be assembled and disassembled in seconds, and an adjustable shoulder strap makes it easy to carry to the beach, campsite, or outdoor concert. The roomy Outer Banks Chair has four reclining positions, mesh cup holders built into the sculpted armrests, and a built-in carrying handle. Comfy and sturdy, they’ll be your go-to summer chairs for years to come. Hey everyone! Alan Davis here, I’m founder and “Chairman” at Blue Ridge Chair Works. I am so excited to be featured as today's Grommet. I design and manufacture high quality portable wooden outdoor furniture that is built for comfort and built to last. I’m a big guy, and I really built all these chairs and tables for me. I wanted comfort and something that would not break. It’s an added bonus that the simple clean lines and solid Ash hardwood make the furniture beautiful. Best of all we are made entirely in Western North Carolina!! Thanks so much for helping me spread the word. I will be here all day and welcome you conversation. @Susan The XL Deck chair has a tested weight capacity of 500 lbs. It will hold more than that but they stopped testing when they ran out of weight and it still would not break. The Outer Banks Chair and the Blue Ridge Chair will both easily hold about 300 lbs. How comfortable is the back of the chair on your neck? I see that it isn't padded. You wouldn't notice from the photos, but there actually is padding on the top where you would rest your neck. We've all tested them here at The Grommet and found them to be extremely comfortable. We've even taken them outside for an afternoon of work! Today, Alan is the founder of Blue Ridge Chair Works, whose mission is to craft American-made outdoor furniture that’s built to last. 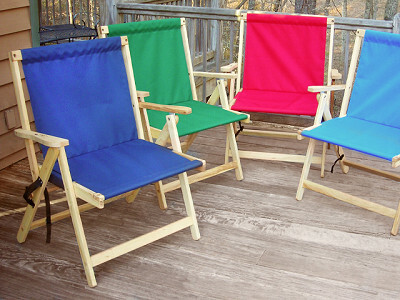 Instead of flimsy beach chairs that buckle and tear, or clunky folding chairs that don’t fold very well, Blue Ridge chairs are compact powerhouses. They’re made in Asheville, N.C., with kiln-dried Ash hardwood and finished with protective Danish oil. Fade-resistant polyester fabric forms the seat, and stainless-steel hardware holds the components together.